Every once in a while, a reader comes along that enjoys your posts enough to scroll back through the old ones without being paid or being a blood relative. That recent reader for me was the very funny “Handflapper” of the blog Handflapping. She read the posts I had written in the last few weeks and somehow made it over to the one I wrote back in 2011 when I suspected my husband was having an affair. It turns out he wasn’t at all. (Whew!) I can’t take a cheatin’ spouse, folks! He just had a very, very flirtatious bus driver who…wasn’t really his type. After Handflapper read that post and some others (we share a liking of Air Supply! ), she e-mailed me something very awesome. She opted for the e-mail route to comment on several posts versus replying to each individual one. I am *so* glad she had this foresight. If she hadn’t contacted me via e-mail, it is unlikely that I would have heard about her husband’s interaction with a very flirtatious female. She told me that when she was dating her husband, he worked at a catfish processing plant. The catfish came in on big trucks and were unloaded WHILE STILL ALIVE into big vats. They were then conveyed down belts where their heads were chopped off with a band saw (I can hardly type this out, y’all!! ), their guts were sucked out and then their skin was removed. This catfish slaying machine was pretty deadly, apparently. People sometimes got THEIR ARMS CAUGHT IN IT! None of us have the slightest clue that people are losing arms for the catfish we see frozen at the grocery store. People are giving their limbs for your frozen fish, folks! Fry that baby up right and grill it like you mean it. Do NOT take that fish for granted. Do not let that fish’s death be in vain! Handflapper’s husband’s job was in quality control. This meant that at 5 a.m., before the trucks unloaded their cargo, he tasted anywhere to 75 to 100 samples of catfish. THE BOY TOOK 75-100 BITES OF CATFISH AT 5 IN THE DINGDANG MORNING and then spit them back out. Still, he shoved 75-100 BITES OF CATFISH INTO HIS MOUTH AT 5 IN THE DINGDANG MORNING. He would take the catfish out of the truck, chop their heads and tails off, stick them in a paper bag, microwave it for about 2 minutes, peel back the skin AND BITE. There was no coating it in Louisiana Fish Fry first. Mr. Handflapper did this THREE TO FOUR times a day. “Lots of women working there thought my husband was the shiz, probably mainly because he had all his teeth back then, but also because he could speak English, he was management, and . . . Well, he can be a pretty charming guy. Most of these women respected the fact that he had a girlfriend (his private life was no secret, it was a family-run business and everyone knew everyone’s bidness and I had been to the plant often, bringing him lunch and sending my then-four-year-old son into the break room dressed like Cupid to shoot him with a fake arrow on Valentine’s Day and what not) and were not psychotic. Uneducated and somewhat toothless, but not psychotic. Except this one woman, who resembled your husband’s admiring bus driver, except 150 pounds skinnier because she was a crackhead. When her flirtatious responses to my husband’s directions to wear her hair net properly didn’t produce the desired effect, she sent him flowers. When he gave the flowers to the receptionist, she slipped him love letters. When he threw the love letters away without reading them, she upped the ante. One day, during his lunch break, he went to his car. I know you know where I’m going with this. Yes, she was in his car. Nekkid. Totally. In broad daylight. The story was just too awesome not to share with you in a blog post, right? 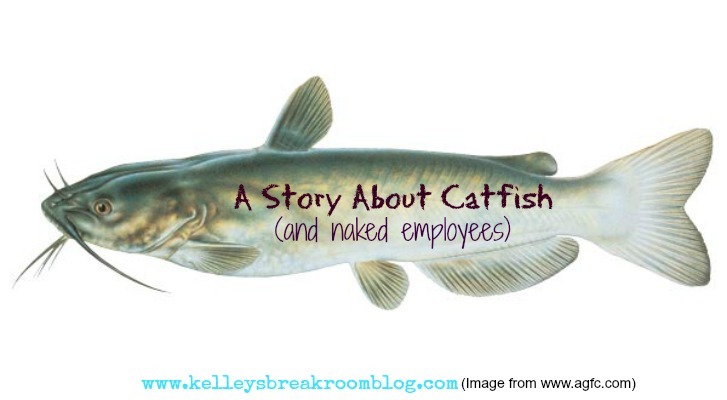 Did you learn anything about catfish processing or naked employees that you didn’t already know? I’m still in Top Chef mania and overdrive over here, but I have now moved those posts to under the Top Chef tab in my navigation bar. I am adding posts daily to that section with things like the chefs’ favorite breakfast cereals and what Tom Colicchio told me (okay, it was via Twitter, but still!) about playing favorites, so please check there if Top Chef is your thing! And, really, how can it not be? I. Love. It. I appreciate every comment, like, retweet, etc., as I am competing to be the #1 influencer for Bravo and Top Chef. Thanks for everything! your face in these places, too!